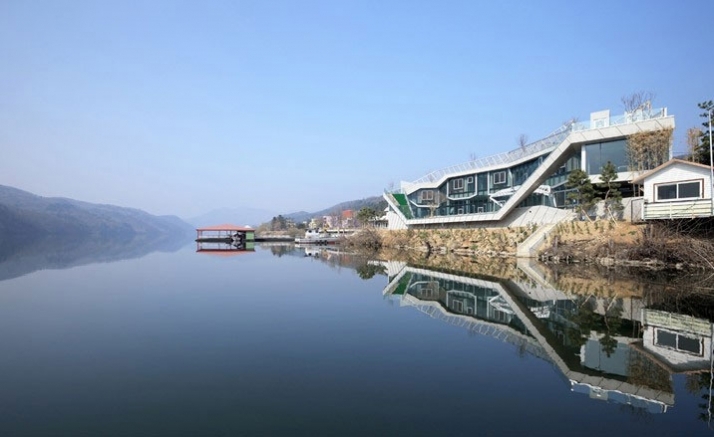 Island House is built on the Han River in South Korea’s Kangwon-do prefecture. 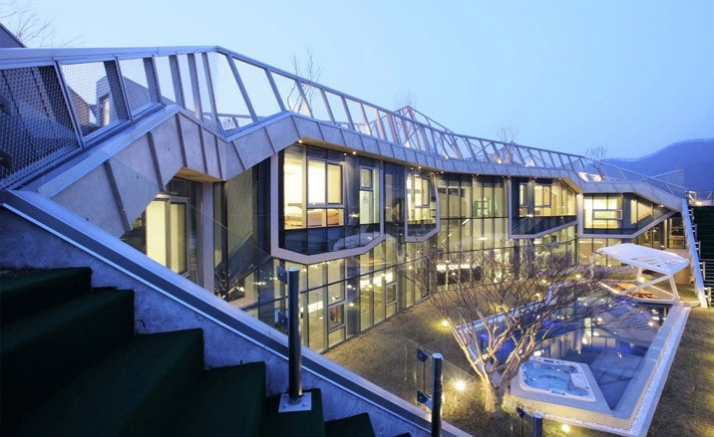 This stunning residential complex runs over an area of over 700 square meters. 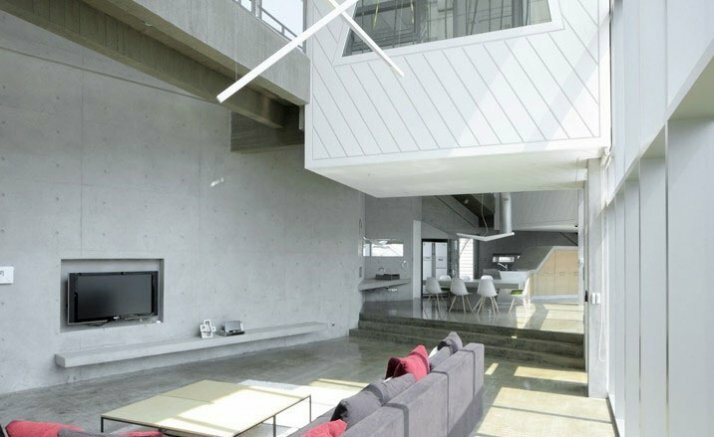 Some images of the Island House very much remind us of a vessel-like construction which reflects its image in the Han River. 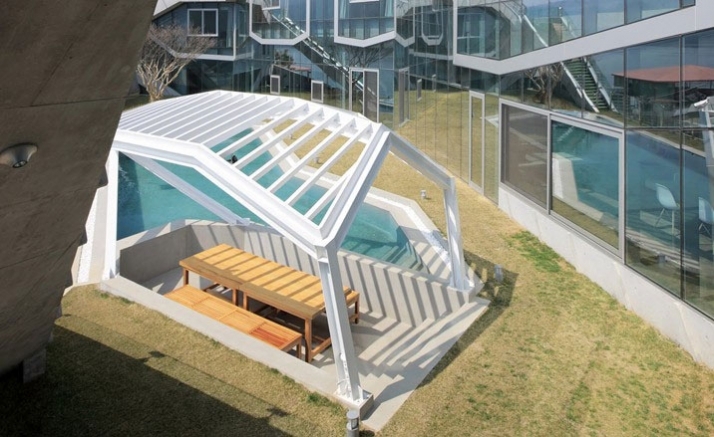 Designed by HyoManKim, of KHM Architects, Seoul this steel structure glass house is a great example of deconstructive architecture. Architectural deconstruction is a development of postmodern architecture that began in the late 1980s. Clearly characterized by ideas of fragmentation, an interest in manipulating ideas of a structure's surface or skin, non-rectilinear shapes which serve to distort and dislocate some of the elements of architecture, such as structure and envelope. Stimulating unpredictability and controlled chaos characterize the final visual appearance of the buildings which exhibit many deconstructivist styles. The angled steel and glass façade is designed in such a way to maximize the views when one is sitting inside the house and enjoys views of the landscape beyond and between different parts of the house. The development is architecturally discrete from its surrounding environment while KHM Architects firmly believe that the house engages with landscape, rather than the site. This argument is clear when one is in the house interior. 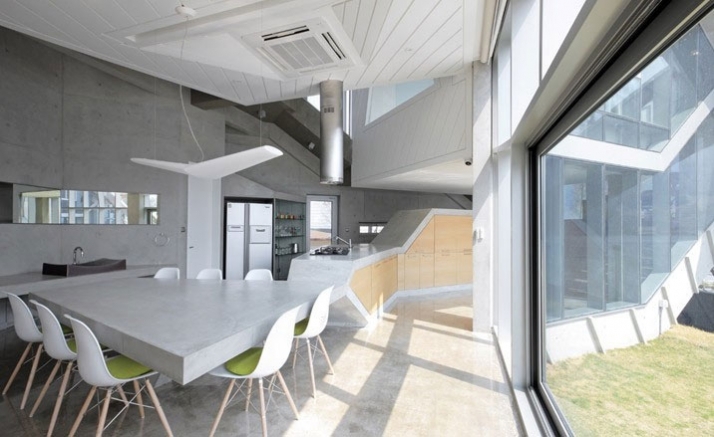 The double-height open plan living space is arranged at the center of the house. 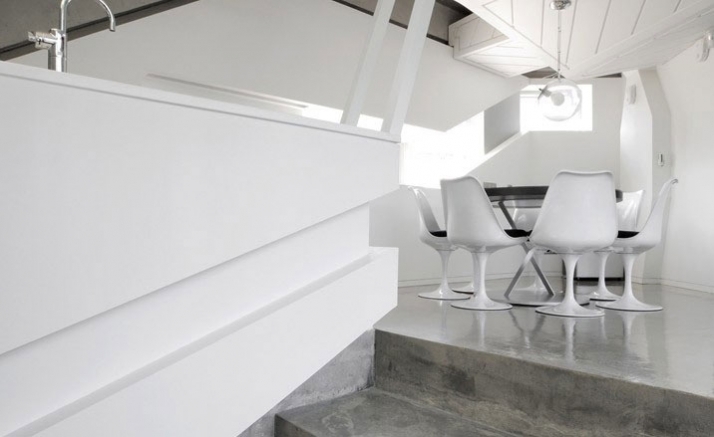 Poured and polished concrete floors and walls make their way throughout the house as they form stairs as well as built in furniture. 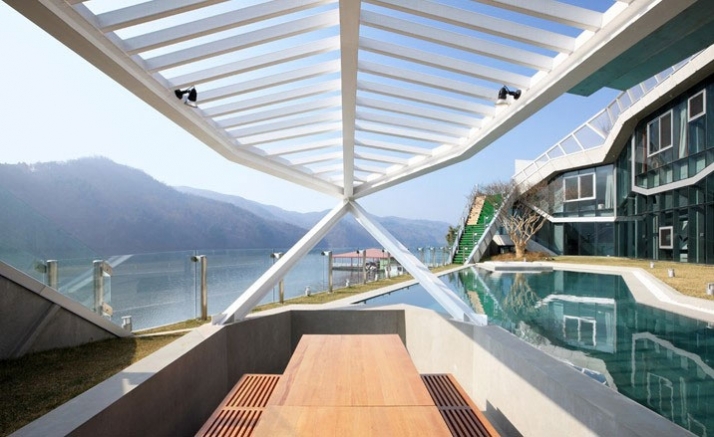 The construction of the house is arranged around a large outdoor pool and a patio with a dining area which covered by a steel structure pergola which is designed in the shape of a speedboat. The exterior landscaping of the house helps create a rather private space with the trees and the pool. A pathway runs from the house to the private marina where the family can take their speedboats and enjoy their excursions in the Han River. The house's structure was engineered by Sung Yeong Oh of MOA, with custom lighting by LITEWORK and furniture by Hee Su Hong. This site, where is floating on Han-river and confronted the graceful landscape in Kangwon-do, was strongly recognized to me as a part of nature, from the first time that I saw it. From then, I started to visualize "the architectural nature" as a place of recreation. While maximizing the efficiency of land use, the leaner concrete mass, that cherishes the courtyard which is filled with the water and the greenery, was laid out on this site along the irregular formed site line. This courtyard is "the architectural nature" and a central recreation space as an extended river that communicates the river with the architecture. The whole part of the step typed roofs, which is moving upward with various levels, are directly linked to the bedrooms in upper floor. Finally, these stepped roof gardens are linked to both sides of the inner court at where the swimming pool is. The inner court which is filled with the water and flower and fruit, and the whole of the roof gardens are circulated as the continuous landscape place and that is the place as "architectural nature" in concept. 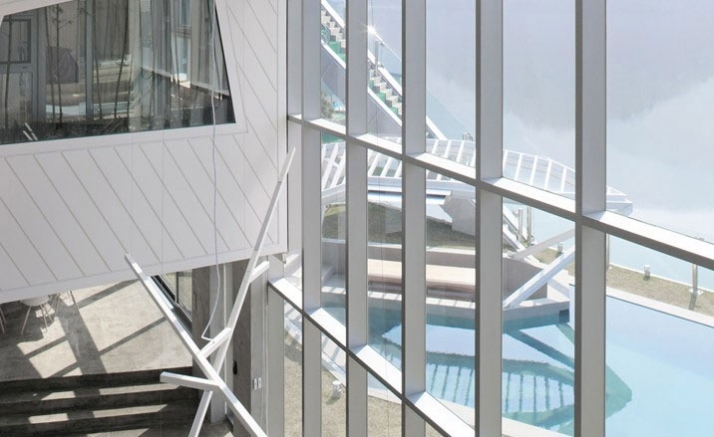 Naturally, all of the rooms inside this site-shaped-mass are laid toward the picturesque landscape to enjoy the graceful scenery surrounded this site. 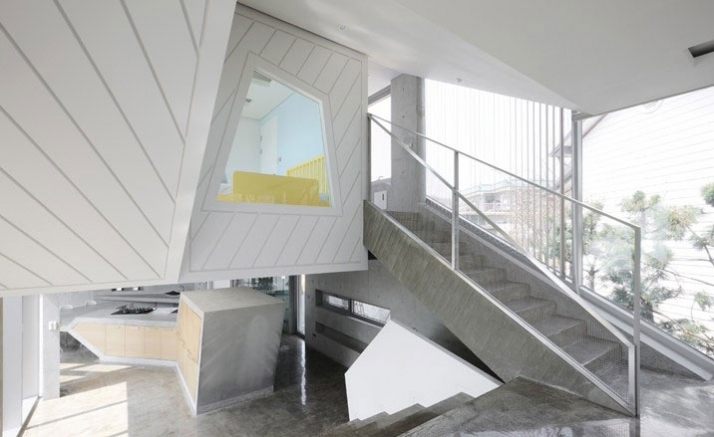 The huge panoramic view framed with sloped ceiling line that is composed with the lines of stepped roof gardens and the bottom line of the inner court, is the major impression of inner space of this house. 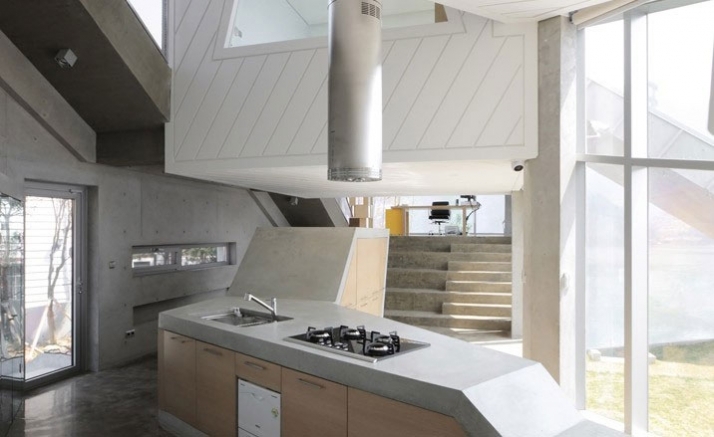 Skip floor plan of inside of this house produced various dramatic spaces. As "the architectural nature", floating white polyhedral masses that have the built-in bamboo gardens produced the various stories of vertical space. The shape of the mountain type composed of irregular polygonal shaped concrete mass and metal mesh was designed to harmonize with the context as "the architectural mountain". There was the intention to be a part of the surrounding context that consisted of the river and the mountain. As a result, this house was to be "The island house" as an "architectural island". 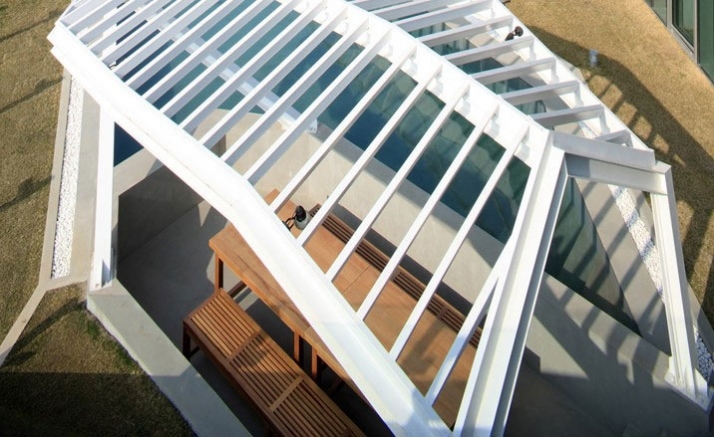 IROJE KHM Architects are award-winning architects in a range of architectural and design fields. Their office is located in Seoul, Korea. 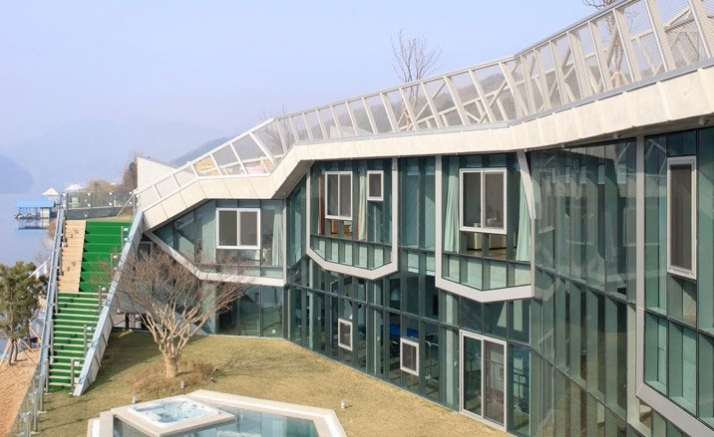 Hyo Man Kim, the principal of IROJE KHM Architects is an architect himself, and concurrent professor of the Graduate School of Architecture at the DanKook University of South Korea, the university from which he also graduated. Iroje Kimhyoman is also editorial adviser of CONCEPT architectural magazine for the past nine years. His office specializes in the fields of architectural design, urban design, and interior design. IROJE KHM Architects has a strong portfolio of successful works since the establishment of their office in 1991.